might be of interest to other visitors? contact me on the About Us page. Another highly respected web site. Based in the USA, but has a large international following. Check out the discussion board and Links pages. Home built renewable electrical power in the UK mainly wind turbines but also hydro, solar and gas. Small site with big ideas, if you are working to expand on your own basic information and knowledge then this is a good place to start. Now this is an interresting read. This person had to go though a lot of paperwork before he could built a windmill tower on his rural property. Has a lot of interresting windmill facts and myths. Bens windmill site. I've watched this site grow over the last couple of years and it just keeps getting better. Check out his "recharge pod". I love this site. It gives wind direction and speed for just about anywhere on the planet. You just select your location, and it will tell you todays wind conditions, forcast for the week, and yearly averages. Great site. http://www.yourgreendream.comHomemade solar, wind and green power diy instructions, information and projects to generate energy at home. There is also a section on reconnecting F &P motor as a alternator. Royal Fabrication in the USA make replacement timber blades for the Wincharger windmills. They can also make blades to custome sizes, worth a look. Randy has a range of windmill projects and kits. He's also a supplier of F&P parts in the USA. From Canada is Rob Beckers solar and windmill site, be sure to check out his forum Green Power Talk. Some radical home windmill projects, and home to the famous blade calculator. Jonathan ( imsmooth on the forum ) has put together a excellent series of pages that explain the chainsaw method in detail. "people interested in the history and preservation of the wind powered battery generators known by the brand name Wincharger". Lots of info and photos. Based at Long Island, NY, USA, Windsine is a renewable energy design and installation company. Informative web site. "The most informative, comprehensive, and up-to-date pages on Australian wind power and wind farms. " American based online magazine mostly about farm pumping windmills. 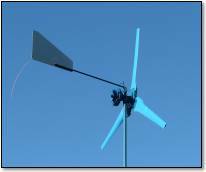 Lonny has put together this general interrest site about solar and wind systems. Home made solar water heater. An article at Mother Earth News about a home made solar water heater. Wikipedia solar cell page. Wikipedia has a lot of information about solar cells. "This page deals with solar power in Australia and major Australian solar power projects. It is independent of any company, lobby group, or government." A tool by SunEarthTools.com to calculate the sun angles for your location at different times of the day and season. Australian based Electric Vehicle site with forum. Who says electric cars are slow! have put together this basic electronics web site, check out the section that explains how batteries work. Chris Simpson's web site has lots of clever electronics projects, info on alternative energy, and even instructions on how to make a composting toilet. Make sure you check out his projects page. Australian based electronics forum, lots of PicAxe stuff. Supplies a big range of microcontroller parts and accessories for the local and international market. Vasi's ( honourable forum member ) Country Laboratory web site. Lots of PIC based projects for RE and CNC. editorial.php?article=1561&zone=18&first=1Interresting article about motors in comercial appliances, and a special mention and interresting facts about the F&P motor.